I’m not entirely sure what I had in mind when I first heard about this bar. Truth be told, I figured it was the cracker or cookie covered in chocolate. 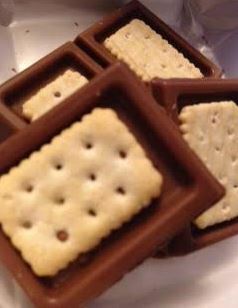 I figured the Lu biscuit would do well, being sweet but felt that Ritz would likely fail as a cheese cracker encased in milk chocolate might not work. 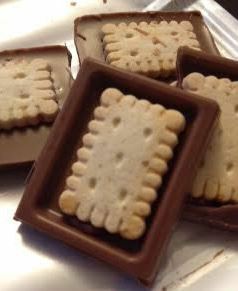 The cookie/biscuit and cracker, rather than being on the inside, is on the outside. This also solves logistical issues around a round cracker. The Lu and Ritz have been recreated in a mini rectangle form and plastered to the exterior of a thinner bar on each side. So imagine you took 2 cookies and put some chocolate in the middle to make a nummy sandwich. Now stop drooling. 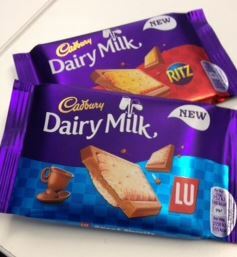 This is what the Dairy Milk Ly and Ritz bars are. Now, at over 180 calories each this is not a light or diet bar but something you can eat and be satisfied after. There are 4 pieces to each bar and the wrapper makes it easy to take a piece and save for later. Ritz – Hard to describe. Not too salty but there is that edge of salt there. Once you break a piece off and pite through the flaky savoury cracker, the chocolate balances it off perfectly with just the right amount of chocolate in each large square to make two perfect bites. The cheese of the Ritz isn’t too pronounced and as such, this makes it a more-ish combination I can’t get enough of. This is my favourite and I’ve been buying them failrly alarmingly regularly. Lu – not as much a favourite. The cookie here is thicker than the Ritx cracker, meaning a more substantial bite but there is the edge of coconut in the flavour which, as I don’t like coconut, is a bit of a turn-off. Despite that I think if you are a Lu biscuit fan if you think the idea of a chocolate sandwich is awesome then you are going to absolutely love this bar. Overall I liked both but I loved the Ritz. It’s a bit of a weird and wacky idea but I think it works. 4 pieces per bar, each piece with 2 crackers or cookies on the outside, chocolate sandwiched in the middle – recipe for success!